As it is pretty expensive I consider to replace the hardware with Ramps on Arduino. Any considerations not to ? I ordered an arduiono + Ramps set. So, maybe the original cause of killing my Gen6 was not the Gen6 ? Got any pictures? what smoked? Yes, Bad Luck. I can not see on the Ramps what might be fried, but it is dead. I now take it component by component. I reconfigured the repetier, to represent most of previous Marlin values, but considering Arduino and Ramps. The Y-motor will try to move both directions at the same time (well it looks like that), until the # of required steps has been executed, so a lot of noise and tremble, but no displacement. No idea what is wrong. This happens on the X-stepper as well. The Extruder motor will do nothing, regardless minimum temp setting or cold print button. Not on the extruder driver, not on the X- or Z- drivers. The re-wired Orca Opto's (in which I fused both leads together to get Lead, Ground and Signal) will not go HIGH while putting the indicator in the stop. They report Low on all attempts for M119. I have not wired the sensors or heaters yet. Edited 1 time(s). Last edit at 09/23/2014 10:00AM by Replace. I am making progress now. I replaced the opto's with new ones that only have 3 wires. They work good. My X and Y will home perfectly and move as expected. Only need to fine tune the steps per mm. My Z will stall while accelerating. I even set max acceleration to 1 (it was 3000) and still it will stall after almost a cm of accelerating movement while homing. Must be something different than just moving, as that will work fine in portions of 10 mm in Repetier host. I got my extruder running also, due to the correct temp sensor conection now. Must be tuned for steps per mm also. Edited 1 time(s). Last edit at 10/07/2014 12:07PM by Replace. Edited 1 time(s). Last edit at 10/07/2014 12:14AM by Chri. So, I crashed my repeater deck. It would not compile any more. Maybe some comments deleted to much or ... anyway, after 2 hours of trying, I started all over again. This time with the repeater configuration help, this is a fine utility. Finally all went well, except steps per mm, which I fine tuned with a ruler for all axis and the extruder. Time for a test print. I made a cross of 100mm and started the print. To my surprise, the hot end will not get hotter than 229 degrees, despite setting it higher. I can not imagine why. Note: I did solder some extension to the original wires, as the Ramps is further away than the gen6 was. Can this be of influence ? Next: The first layer looks amazingly good. Nice flow of plastic, nice bonding, but than it starts behaving funny. All next layers are shifted off centre. Even within a layer, a travel move will render the object to print out of sync with the previous layer. Images of testset and prints are attached. Already, after the skirt, the start of the print is off centre. Seems to loose steps ?, what are your travel, Acceleration any Yerk values ? have you set the vref (to about 0,4v) ? I have attached the new repeater deck that I generated by configuration utility and changed for some parameters based on experimental measures of steps per mm travel. Can steps be lost by to high speeds or accelerations ? I have never lost steps previously tat were not based on slipping belts. Belts are fine now, as the were before on the Gen6. Edited 1 time(s). Last edit at 10/09/2014 05:44PM by Replace. Depending on your printspeed 3000 Acc can be a little bit high for the heavy bed to move, try to reduce acc to 2000 and Yerk to 15 , or raise your vRef a little bit. For what i know camiel even was going down to 1000 acc at the orca`s where he was printing the parts, but that may be a little bit to slow when printing faster causing blobs at corners. yerk defines the maximal speed with which a direction change can be made. when you set Yerk to 15mm/s it will slow down to 15mm/s when changing the direction. A higher value results in less blobs on the corner change when printing at higher speeds but results in a optical wave at the surface of the opposite direction because of a harder start, but may result in loosing steps. So the challange is to find the best value between speed and quality. your suggestions were just what I needed. See the progress in the attachment. The last one (top) with 1000 acceleration, 1000 travel and 10 yerk. i think that covers for the missing steps. 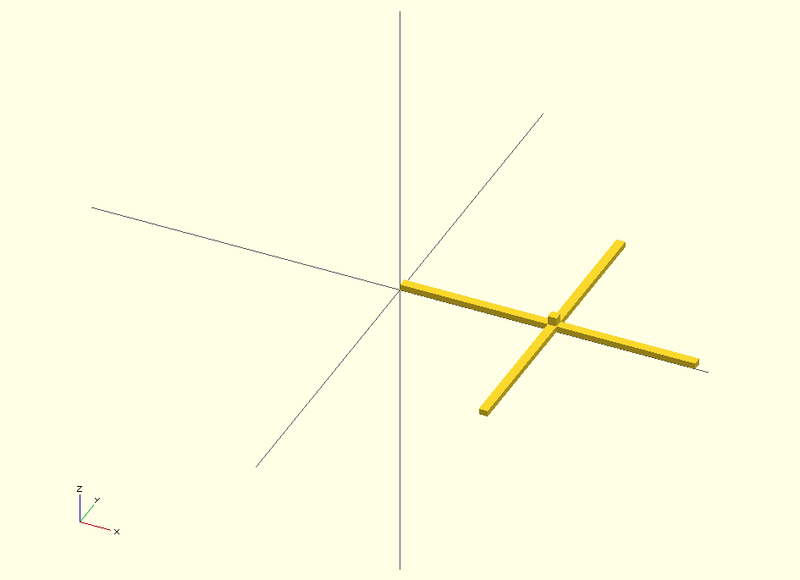 Also my cross measures 100x100 mm in Openscad and 100.01 and 100.4 after cooling down, so i am almost there too. One thing puzzles me though: first layer bonding is not ok. filaments lie loose from each other, except for te infill. So infill does not bond nor attaches to perimeters. Edited 1 time(s). Last edit at 10/10/2014 10:41AM by Replace. with what do you create the gcode ? settings ? Do o move Z by hand at the first layer (as normally done on orca`s) or do you calibrated Z value. Can you upload the gcode, so i can try it out to see what happens ? I calibrated the Z home by usage of the end-stop, to stop at a paper sheet getting drag. That worked for the last 2 years on the Marlin front, so I think that must work for Repetier. Be aware that I normally have the heated bed on approx 90 degrees, which gives nite bonding and a flat surface on glass. Currently that glass is not heated yet. Still have to wire that. I slice with Slic3r, with a 0.25 layer on 0.35 mm nozzle. My infill currently is 20% And I tried to multiply the extrusion by 1.1 but that did not help the first layer bonding. I Just checked the code. * activate brim, two brim lines normally do the job, so your nozzle is 0,35? then make a 0.7mm brim. * your layerheight of 0.25 is way too much for a 0,35 nozzle, normally the rule is don`t go over 1,6:1 from the nozzle diameter so the maximum should be 0,21875 , go fo 0,2 and you get much better parts. * on such cross parts its better to make a 90° infill instead of 45°. me and my friends have Z always set too high and adjust the height when the printer starts with skirt/brim and the first layer, this way we have always a good sticking 1st layer, after short time you get used to it how you have to set Z. Best thing is to make a small part (20x20 or 30x30) with 100% infill and check if the extrusion is too muchs, so therfore always go from too much extrusion to less, not the other way. * activate the cool feature so the upper part of the small cube`s won`t melt because of a too short layer time. i`m not at home tomorrow, maybe i can make a Testprint on sunday. Edited 1 time(s). Last edit at 10/11/2014 02:46AM by Chri. Thanks. I will experiment wit your suggestions. I have got it working now, but I had to lower speed and acceleration very much, down to 200, before steps were not missing any more. So it is a bit slow now. But, I can't get the temp higher than 226 - 228 degrees. Than it shift between 226 and 228. 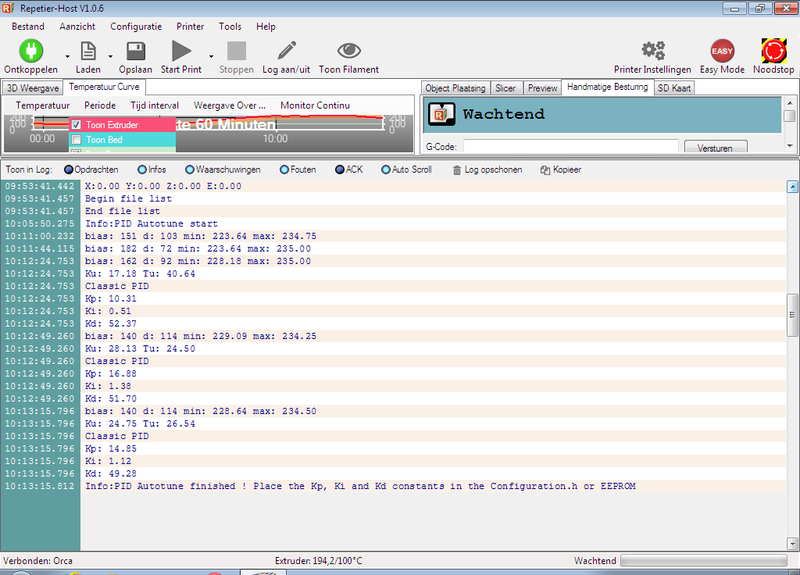 But my Host says 240....... and my max temp in the deck says 260, so what parameter s still faulty ? Any idea ? i never used repetier, have you made the PID tuning for the Hotend (for example M303 E-0 S230 C5 , to make the tune to 230°C and 5 cyles)? For example your PID is at the Moment 7,2,40 , my PID on marlin is 51,3.2,199 for the V10 Hotend. deactivate babystepping and quadstepping, i read some people have problems with this on repetier. I am afraid I don't understand the PID parameters. I have not messed with them after I made the config with the urility. i only messed with the speed stuff. Also, where do babystepping, quadstepping and microstepping come together ? With current config.h, my printer is slow, but sooooo smooth :-) And I can hardly hear it running. Much quieter that the Gen6 history :-) But a bit faster would be nice. Microstepping is defined with the jumpers of your ramps board, so the value at the firmware don`t do anything afaik. I will do the test like you specified. What function do I disable with baby and quad stepping is shut off? Edited 1 time(s). Last edit at 10/21/2014 02:36AM by Replace. TYhe process gives a sequence of PID values. Which one should I use in the code ? the extruder heated up to 230+ during this process. However, when it started cooling down, I set the ruler at 230 and submitted a print. From that time heating failed at 225 again. You may also make the PID Tuning when the hotend is still cold and not 100° but that just may take longer. Should I increase that to 240 ? If I want to reach 240 ? hmm, didn`t knew this value before, i looked for it. this value is not a temperature, this is the maximum power that is delivered to the hotend when the PID algorithm is active., 255 would be full power.